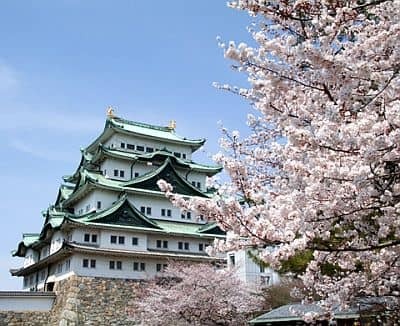 In Nagoya, a city of Japan, located in the central part of the island of Honshu, in Aichi Prefecture, the climate is humid temperate, with quite cold winters, and hot, humid and rainy summers. 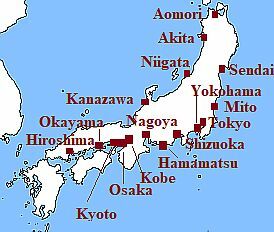 Like the rest of Japan, the city is affected by the monsoon circulation: in winter the northwest cold currents will prevail, while in summer they will be replaced by hot and humid currents of tropical origin. Nagoya is located a short distance from the sea, north of Ise Bay, in the Nobi Plain, an area famous for being particularly hot in summer. In winter, mild periods, with highs around 12/15 °C (54/59 °F), alternate with cold and windy periods, with highs around 5/7 °C (41/45 °F) or less, and possible snowfalls (usually light). At night there may be slight frosts. In summer, hot and muggy periods, with sunshine, highs around 35 °C (95 °F) and above, tropical nights and high humidity, alternate with periods of bad weather, with wind and rain, and sometimes (especially in June) a little cool at night. August is the hottest month, both because of the thermal inertia of the sea and because of the lower frequency of periods of bad weather. The rains are abundant, in fact they amount to 1,500 millimeters (60 inches) per year. Winter is the driest season; the rainiest months are June, July and September. In August, there is a certain decrease in the frequency of rains: on average, among the summer months, it is the driest and sunniest as well as the hottest. From June to October (but especially from August to early October), Nagoya can be affected by typhoons, the tropical cyclones of South-East Asia. On September 26, 1959, the city was hit hard by Typhoon Ise-wan (also called Vera). The cherry blossoming in Nagoya takes place around April 1st. The amount of sunshine in Nagoya is good in winter (there are 5 hours and a half or 6 hours of sunshine per day from December to February). In the other seasons, the sun does not shine very often because of both the disturbances that occur in spring and autumn and the summer monsoon: in summer, there are 5 hours of sunshine per day in June and July, and 6 and a half in August. The sea is warm enough for swimming, with a temperature of 23 °C (73 °F) or more, from July to October, as you can see in the following table.